Star members receive 15% discount, plus collect double points when booking a room using your “SHGSTAR” member promotion codes through our hotel websites or book through the links below. Free room upgrade to the next level category when booking a room including breakfast. Late check-out at 3 pm (subject to availability). 500 Baht discount coupon for buffet dinner at Patummat Restaurant when booking a room through The Sukosol Bangkok’s website. Free voucher for “Afternoon Tea Set” at The Greenery when booking a room through Siam Bayshore Pattaya’s website. Free voucher for “Afternoon Tea Set” at Exotica Bar when booking a room through The Bayview Pattaya’s website. 15% discount for food and beverage at any restaurant and Room Service in The Sukosol Bangkok, Siam Bayshore Pattaya, and The Bayview Pattaya. 10% discount for food and beverage at any restaurant and Room Service in Wave Pattaya. 15% discount for laundry at The Sukosol Bangkok. 30% discount at Lotus Spa in The Sukosol Bangkok and Siam Bayshore Pattaya. 10% discount at Salon of Siam in The Sukosol Bangkok. This promotion is applicable to The Sukosol Bangkok, Siam Bayshore Pattaya, The Bayview Pattaya, and Wave Pattaya. Booking period is from 1 June to 31 July 2018 and double points benefit is only available on room charges. Period of stay is available from 1 June to 31 October 2018. 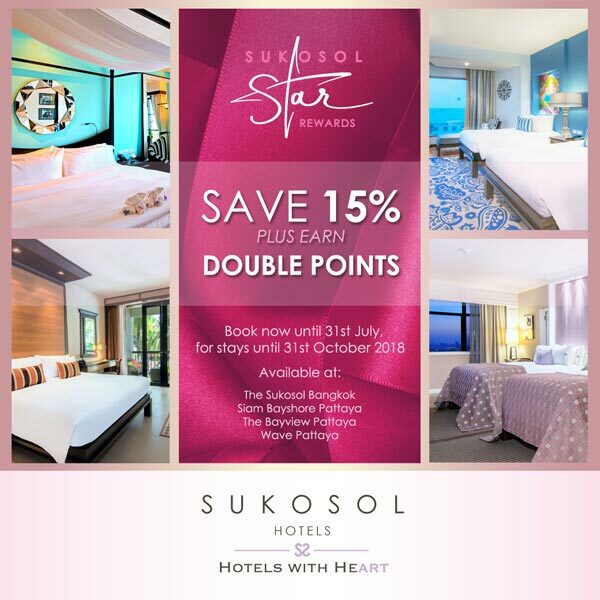 Sukosol Hotels reserves the right to change benefits without prior notice and this promotion is not valid in conjunction with any other promotions. For questions or enquries, please email star@sukosolhotels.com. Treat yourself to a day of pampering, spa treatments and fine dining in your own city and all Just A Boat Ride Away. 60 minutes is all it takes to learn the secrets of the trade... It’s easy and fun to study simple Thai massage techniques with our experienced teachers. Be the first to enjoy our new Sukee Wonderland with your family.